If you are a regular visitor to this blog you know I love making marshmallows! 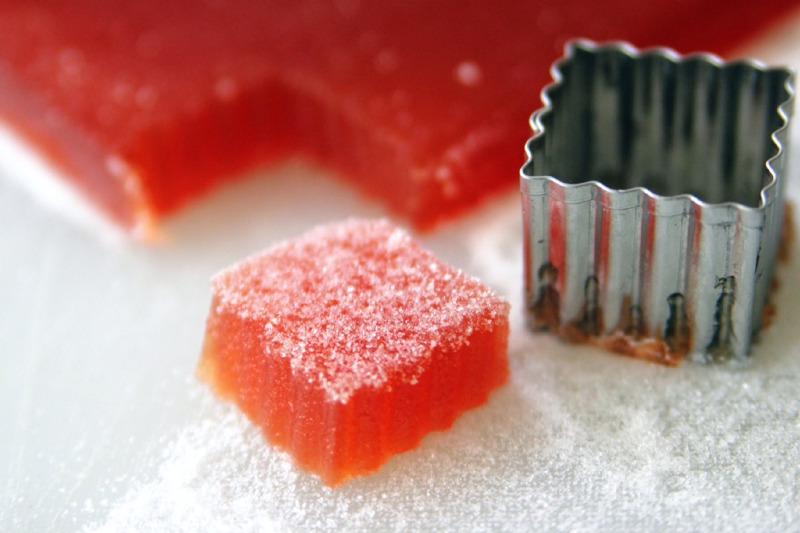 They're fun, magical, scrumptious, and versatile, lending themselves to a variety of flavorings. With the holidays approaching, the addition of crushed candy canes add a festive touch. Making marshmallows is a bit like making magic. A few basic ingredients -sugar, water, gelatin, and corn syrup- morph into pillowy marshmallow deliciousness right before your eyes. They're fun to make and bear little resemblance to the "jet puffed" variety you find on your grocers' shelves. Add flavorings like pumpkin puree and spice and you've got some Halloween sorcery going on in your kitchen! Growing up, chocolate covered orange peel was my favorite confection. The pairing of chocolate with orange tasted so special. 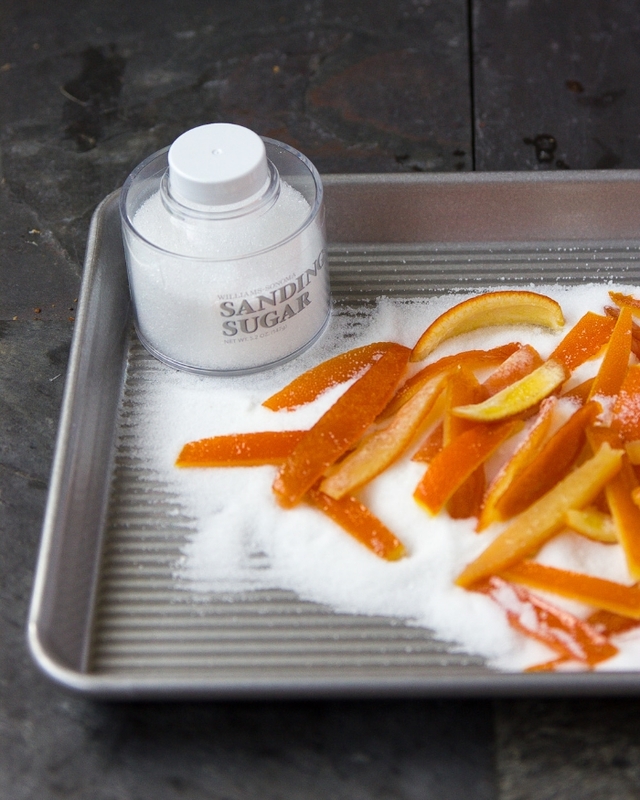 With the abundance of oranges in December, this is a great time to make your own candied orange peel. Perfect for gift giving or holiday baking, fruitcake, panettone, cakes and muffins get their zing from candied orange peel. Or dip them in chocolate for an extra special treat. Cut the top and bottom off the orange. Score the peel in quarters and remove. Julienne into 1/4" slices. Put them in a 4 quart saucepan and cover with cold water. Bring to a boil, remove from heat and drain. Repeat three more times. This process helps to remove any bitterness in the skins. In another saucepan, combine the sugar, corn syrup and water. Bring to a boil and continue cooking until you reach 230F on a candy thermometer. Add the blanched peels. Simmer gently, do not boil, in the syrup for about 30 minutes or until the skins become translucent. Line a sheet pan with parchment, foil, or wax paper. Place a cooling rack over the paper. Remove orange peels from their cooking liquid. Place on the rack, drain, and toss with granulated sugar. Allow to dry for several hours. Or if you have a dehydrate setting on your oven, you can place the peels in the oven to dry for about an hour. For a truly delicious treat, dip the peels in tempered chocolate. Store in an airtight container for up to 2 weeks or place in zip lock bags and freeze. In another saucepan, combine the sugar, corn syrup and water. Bring to a boil and allow the temperature to reach 230F on a candy thermometer. Add the blanched peels. Simmer gently, do not boil, in the syrup for about 30 minutes or until the skins become translucent. Remove from the syrup, drain, roll in granulated sugar and allow to dry for several hours on a cooling rack placed over a parchment lined baking sheet.